Built in 2007, the pond is shaped like a long horse-shoe and is approximately 6,000 gallons. The dimensions are 19ft x 10ft x 5ft deep. It is constructed of block and render, finished with fibreglass and is 2 feet above ground and 3 feet below. 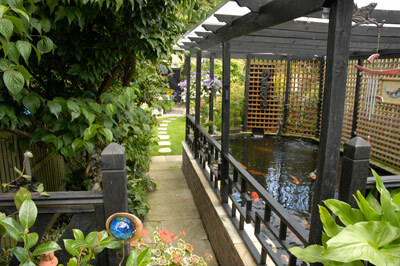 The whole pond is covered by a pergola. Filtration is via two bottom drains and a skimmer, which feed a profi drum filter. The water is then pumped via a Badu Eco Touch Pro pump to two showers situated at opposite ends of the pond and a small bead filter from which it returns to the pond via an underwater feed. Apart from the showers the rest of the filtration equipment is housed in an underground chamber below our decked patio. 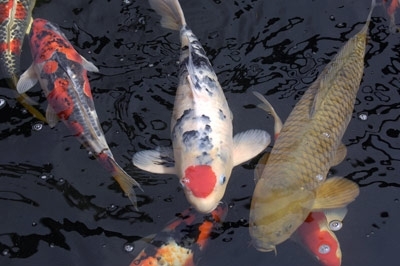 The pond houses approximately 60 Koi of a wide variety and is heated by a dedicated gas boiler. There are three air pumps in use on the pond and a Pro Clear 110watt UV. 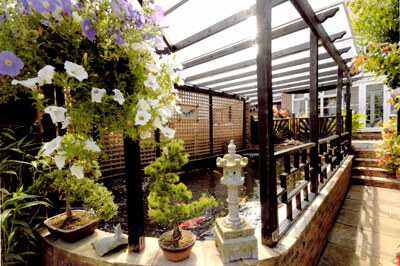 Due to the fact that we have a mid-terraced house the pond build was no easy task. With no rear access everything that was dug out had to come through the house. 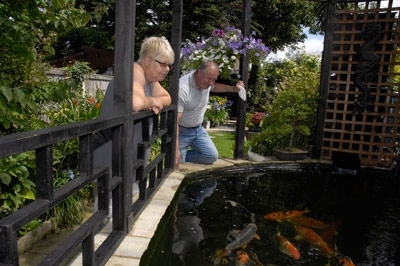 There is a second pond at the end of the garden, which serves as a nursery or quarantine facility. This is hexagonal in shape and holds about 1,000 gallons. A pergola has been constructed over this pond and it is filtered by an Evolution Aqua Eazy Pod and heated by a cloverleaf 2Kw electric heater.